Canada Corporate Forms. 100% Guarantee. Lawyer Prepared. 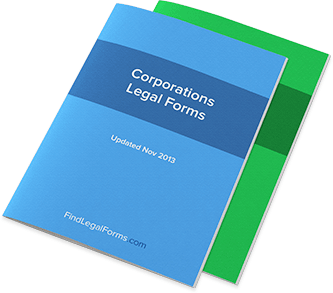 Corporation forms which will be useful in setting up and maintaining a corporation. Forms include Articles of Incorporation and Bylaws, Board of Directors and Shareholders agreements and meeting minutes. Directors Indemnity Agreement (Canada) Directors Indemnity Agreement for use in all provinces except Quebec. Asset Purchase Agreement - Business - Long Form (Canada) Comprehensive agreement between a buyer to a seller regarding the sale of a business's assets. Asset Purchase Agreement - Business - Short Form (Canada) Short form agreement between a buyer to a seller regarding the purchase of a business's assets. Letter of Intent to Purchase Assets of Business (Canada) Letter of Intent to be used when a buyer wishes to express interest to purchase the assets of a business from a seller. Business Plan Confidentiality Agreement (Canada) This Confidentiality Agreement to Protect Business Plan is designed for use in Canada. This form is available for immediate download. Bylaws Bylaw kits to assist you in the formation of your corporation. Manufacturing Agreement - According to Sample (Canada) Agreement to manufacture a product according to a sample. Ballot for Shareholders Meeting (Canada) Template for ballot to be used at a shareholders meeting. Certificate of Incumbency (Canada) Certificate confirming the directors and officers of a corporation. General Proxy (Canada) General proxy for use in all provinces except Quebec. Irrevocable Proxy (Canada) Irrevocable proxy for use in all provinces except Quebec. Revocable Proxy - for Special Meeting (Canada) Revocable proxy for use in all provinces except Quebec. Revocation of Proxy (Canada) Revocation of proxy for use in all provinces except Quebec. Voting Trust Agreement - 3rd Party Determines Vote (Canada) Voting Trust Agreement (appointment by shareholder, but 3rd party determines vote) for use in all provinces except Quebec. Voting Trust Agreement - Appointment by Shareholder (Canada) Voting Trust Agreement (appointment by shareholder) for use in all provinces except Quebec. Annual Meeting Kit - Board of Directors (Canada) Various forms you'll need for your annual board of directors meeting. Annual Meeting Kit - Shareholders (Canada) Various forms you'll need for your annual shareholders meeting. Annual Meeting Minutes - Board of Directors (Canada) Minutes for the annual board of directors meeting for use in all provinces except Quebec. Annual Meeting Minutes - Shareholders (Canada) Minutes for the annual shareholders meeting for use in all provinces except Quebec. Annual Resolutions - Board of Directors (Canada) Resolutions to be used in conjuction with the annual meeting of the board of directors. Annual Resolutions - Shareholders (Canada) Resolutions to be used in conjuction with the annual meeting of the shareholders. Directors Resolution Appointing Officers (Canada) Unanimous Written Consent appointing officers for use in all provinces except Quebec. Directors Resolution Approving Employee Stock Option Plan (Canada) Unanimous Written Consent approving an Employee Stock Option Plan for use in all provinces except Quebec. Directors Resolution Approving Sale of Assets - Canada Resolution of directors of corporation approving sale of a substantial part of corporation's business. Directors Resolution Approving the Transfer of Shares (Canada) Unanimous Written Consent approving the transfer of shares for use in all provinces except Quebec. Directors Resolution Authorizing a Cash Dividend (Canada) Unanimous Written Consent authorizing a cash dividend for use in all provinces except Quebec. Directors Resolution Authorizing a Stock Dividend (Canada) Unanimous Written Consent authorizing a stock dividend for use in all provinces except Quebec. Minutes for the Meeting of Shareholders or Directors(Canada) Minutes of the Meeting template for use either for a shareholders or directors meeting. Shareholder Resolution for the Election of Directors (Canada) Shareholders Resolution electing individuals as directors of the corporation. For use in all provinces except Quebec. Shareholders Resolution Approving Sale of Assets (Canada) Resolution of shareholders of a corporation approving the sale of substantial part of corporation's business. Unanimous Written Consent of Directors (Canada) Written conset of directors to be used in lieu of a meeting. For use in all provinces except Quebec. Declaration Regarding Lost Share Certificate (Canada) Declaration regarding a lost share certificate for use in all provinces except Quebec. Declaration Regarding Lost Share Certificate - Corporate Shareholder (Canada) Declaration regarding a lost share certificate for use in all provinces except Quebec. Indemnity Regarding Lost Share Certificate (Canada) Indemnity regarding a lost share certificate for use in all provinces except Quebec. Notice of Stock Option Exercise (Canada) Notice of Stock Option Exercise pursuant to a Stock Option Plan. For use in all provinces except Quebec. Share Purchase Warrant (Canada) Share Purchase Warrant Agreement for use in all provinces except Quebec. Stock Option Agreement- Long Form (Canada) Stock Option Agreement for use in all provinces except Quebec. Stock Option Agreement- Shareholder as Grantor (Canada) Stock Option Agreement (with Shareholder as Grantor) for use in all provinces except Quebec. Stock Option Agreement- Short Form (Canada) Stock Option Agreement (Short Form) for use in all provinces except Quebec. A corporation is a legal and business entity with separate rights and liabilities from its founding (as well as new) members. Corporations are formed for a number of reasons: to organize a new business, to protect its members from liabilities and to pool resources together. In essence, a corporation is simply a type of business; usually larger businesses register as corporations in order to handle a larger amount of members, stock owners, and partners. There are different types of corporations that can be registered. Understanding the different benefits and features of each corporation type is important if you are planning on creating a corporation for your business, as some corporation types are better suited for different business models and industries. What kinds of corporations exist? General Corporation, or C Corporation: The most common corporation structure in the U.S., the C Corporation is popular because it allows for an unlimited number of stockholders – ideal for big businesses that plan on having a lot of investors or even going public with their shares. If you are planning on having over 30 stockholders in your corporation, you will likely be looking to file for a C Corporation structure. S Corporation: Also known as a Subchapter S Corporation, this corporate structure is ideal for sole proprietors who want to be registered as a corporation but still enjoy many of the benefits of sole proprietorship. Needless to say, is a common type of corporation for smaller businesses, as the maximum number of stockholders is currently at the level of 75. These are two of the most common types of corporations. If you see a company registered as an LLC, remember that the “C” actually stands for “Company,” and the organization registered thusly is technically not a corporation. There are, however, many similarities between LLCs and small corporations. What kind of corporation should my business be? That will depend on your business’s goals and needs. If you are a one-man or one-woman operation and don’t have a big need to expand with more members, you may be just fine running a sole proprietorship; in time, you may want to register as an S Corporation. If you have a business that is in need of outside money and is looking to expand, then a C Corporation will likely be in the cards. However, to get the best gauge on your situation, you’ll need to know more than these simple goals; you’ll need to know the precise limitations and capacities of each corporation type. What kind of limitations does an S Corporation have? Registering as an S Corporation comes with a number of benefits, such as the tax benefits of a sole proprietorship. However, this advantage also comes with a number of limitations. For example, passive income (such as income on rental property) cannot constitute more than 25% of the gross revenues of an S Corporation. Additionally, offering stock is difficult, as there is only one class of stock to be issued and the amount of shareholders has to be limited to 75. For many sole proprietorships, however, registering as an S Corporation allows for additional liability protection while not increasing tax burden. You don’t necessarily have to. Again, it depends on your business and legal needs. The advantages to filing for corporation status are numerous; it helps to keep your liability in business dealings down while also allowing you certain tax benefits. However, there may be some limitations in certain types of corporation filings that you’ll want to be aware of. The best way to evaluate your own incorporation needs is to evaluate the needs of your business and then research which corporation type suits those needs the best. It’s also important to confer with any other members of your business. How do I file for corporation status? Filing for corporation status is not as difficult as it sounds. It merely requires the right paperwork and that you follow all of the procedures involved. Many downloadable corporation forms will come with instructions for filing for corporation status in your state, so be sure that you use the forms relevant to your company’s location. From there, you should have no trouble preparing the forms by filling in the blanks, reading them through, and sending them to the appropriate state office. Besides registration forms, what other kind of relevant corporation forms exist? There are a number of corporation-related forms you’ll likely need after incorporating your company. For the most part, it’s most convenient to download these forms in a combination package to ensure that all of the necessary forms you need are at your disposal. However, you may simply have a need for a few individual forms, such as Minutes of Shareholder Meeting or Board of Directors Unanimous Written Consent. From the perspective of start-up forms, many of the popular forms you’ll need include the Articles of Incorporation, Amendment to Articles of Incorporation, etc. It’s good to have all of these at your disposal. What kinds of contracts are relevant to corporation formation? Typically, the formation of a corporation does not require contracts from the perspective of the state with which you’re filing your corporation; however, it is important that you have written contracts with all members involved with your company, such as a Partnership Agreement that lays out the details of how a business is to be structured. Having these contracts in writing will be good for your own sake; however, what’s important to the state is how your corporation is registered and structured. When is my corporation registered? It will depend on the state you’re filing with; typically, the wait is not long. But you’ll want to check with your local state government before assuming that your corporation has been properly filed; this will ensure that you’re handling all of your legal undertakings under the right context. Things will move most quickly when you use the relevant in-state forms for your corporation filings.